How was your Mother's Day? Was it full of love and flowers, appreciation and kindness? If so, I'm so glad that yours was better than mine. 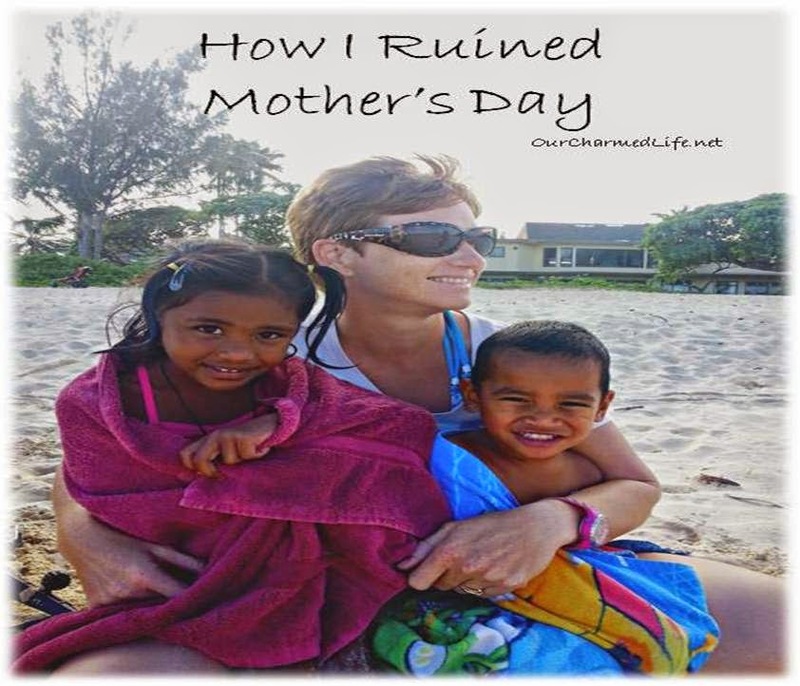 My Mother's Day was awful and it was all my fault. I wanted it to be a great day. I wanted breakfast in bed while I binge-watched House Hunters (because the TV fast is over!). I wanted the kids to listen to me and I wanted everyone to be nice to me. Those were my specific goals and I shared them with D while we watched a movie with the kids on Saturday night. I have tried to make open communication a major facet of our family and I thought I was enabling that by telling D what I wanted. Unfortunately when I said I wanted people to be nice to me on Mother's Day, my family heard that I wanted them to be kind to me. What I meant was that I wanted everything done for me. I wanted to not have to clean up, to not have to manage the house and our lives, to not have to do my job in our family for the day. I thought that would be enough: I communicate what I want and it gets delivered, right? The day started out great with biscuits and gravy and TV in bed. The kids loved on me, D brought me coffee, and all was sweet and calm. And then it wasn't. There was a miscommunication, then another one. Emotions were misread on all sides. Kids were snapped at and tide of family love receded pretty far. While it takes two people to fight, I'll take full credit for this one and say that I ruined Mother's Day. I could have put a stop to all the negativity at any time and I didn't. I felt I deserved something and that I wasn't getting it. Those miscommunications earlier in the day led to my (poorly expressed and fairly selfish) expectations not being met and that made me angry. Like a child, I acted out against my loved ones as an expression of my disappointment and frustration, and it made for a pretty ugly day for everyone. Eventually things came to a head, words were said and feelings aired. We worked things out and moved on. The next day was wonderful. Bread got made, play dates and bounce houses happened, naps were taken, and good times were had on Ebeye. D smoked ribs for dinner, the kids and the house got cleaned, and the day ended on the same cheerful note it started on. What made the day so much different than the terrible one before? Expectations, or rather, a lack of them. The day was like any other weekend day and because I didn't have a different mental plan from the rest of my family, they couldn't let me down. What's the take away message here? Besides the fact that I want this story as a reminder to myself about how I could have chosen happiness, something I'm constantly reminding my children to do, I want this to be a cautionary tale to others about the power of expectations and how little unspoken things like that can ruin everything if you let them. If a situation isn't going well, ask yourself what part your expectations or those of others are playing into it. Should they be let go or can they be met? My recommendation, to myself and to you, is to do the one that lets you choose happiness. Have you ever found yourself in this kind of situation? Was it your expectations or another persons that was the culprit? Were you able to resolve things for everyone? I've love to hear your story if you want to share it. Mother's Day has to be the most emotional day of the year! Geez. Mine was good this year but it seems like almost every other year I'm either a little disappointed or seriously frustrated! I think expectations has a lot to do with it. Being around small children is just not relaxing! But somehow we think Mother's Day magically will be. My husband had the foresight to get a babysitter this year! Best choice ever! A baby sitter is a great mother's day gift- lucky you! And yes, I don't know why we think that for one day, everything will be different than it was the day before. Kids aren't going to turn into perfect little people for those 24 hours just because the day has a special name. I love your authenticity. Expectations can be huge cause of unhappiness. I think we are all guilty of them at one time or another. Myself included :-) I'm glad you had a wonderful day after Mother's Day! Thanks Erin, and thanks for stopping by! It's funny, I've learned to let go of so many expectations when we travel with our kids and it's made our trips so much more fun but at home, those expectations persist. Everyone is a work in progress, right? Hope you had a good mother's day!